In medium saucepan, combine rhubarb, sugar and juice drink; mix well. Cook over medium heat for 10 to 15 minutes or until rhubarb is tender and mixture is syrupy, stirring occasionally. Add 1 cup of the strawberries; cook and stir 1 to 2 minutes, mashing slightly. Remove from heat. Stir in remaining strawberries. Cool slightly. Refrigerate at least 1 hour or until chilled. Just before serving, in medium bowl, beat whipping cream, powdered sugar and vanilla until stiff peaks form. Cut pound cake into 16 slices. Place 2 slices on each dessert plate. Top slices with sauce and whipped cream. 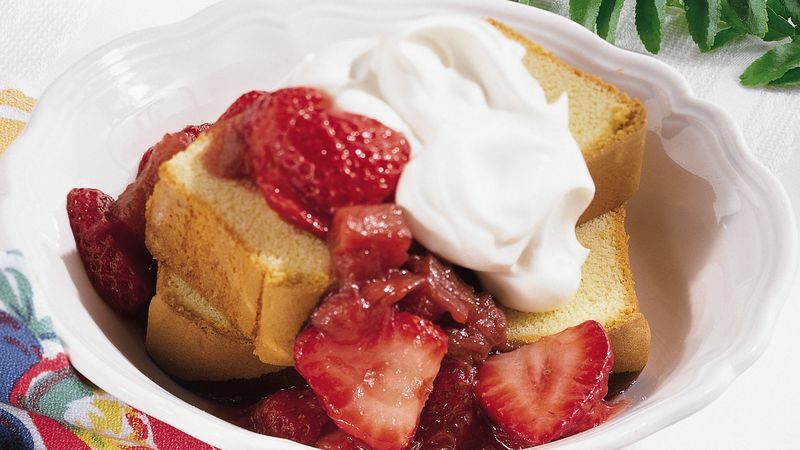 If desired, garnish each serving with fresh strawberry slice. Rhubarb is an extremely tart vegetable harvested from a large-leafed plant related to buckwheat. Choose crisp stalks with fresh, blemish-free leaves. Depending on the type of rhubarb, stalks can range from pink to bright red. The rhubarb leaves are toxic and should be discarded. Anel food cake or spronge cake cups can be used in place of the pound cake in this dessert. Prepare the sauce up to one day in advance; cover and refrigerate it until ready to serve.